Here at Grow It! Eat It! we’re going to start participating in Garden Bloggers’ Bloom Day on the 15th of each month, but in our own style focusing on edibles. Hm, May is a hard month, chez Erica at least. Bob did bloomin’ blackberries already. I think this month I’m stuck with herbs. Not that there’s anything wrong with herbs. Chive flowers are starting to fade, but still attracting lots of bees – and remember to put them in your salads! The chive blossoms, not the bees. 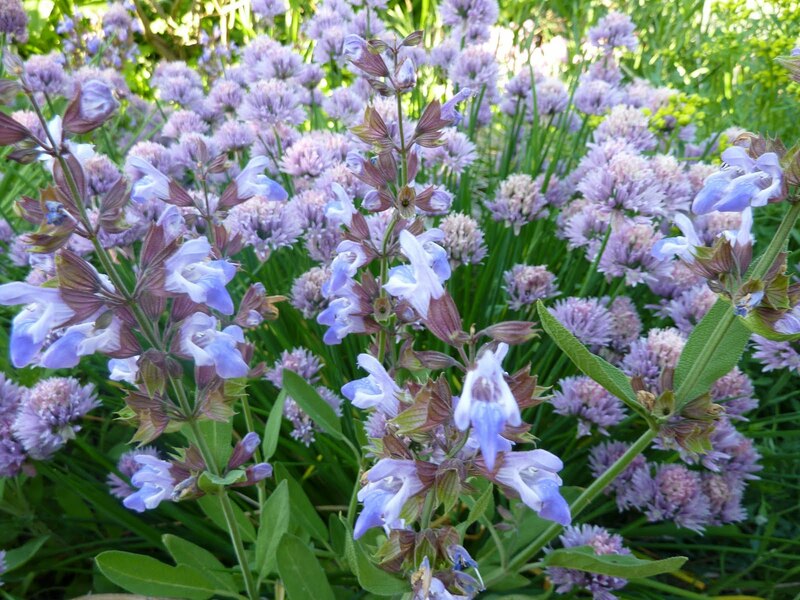 And my sage plants are in gorgeous full bloom – the herb bed is a symphony in purple. 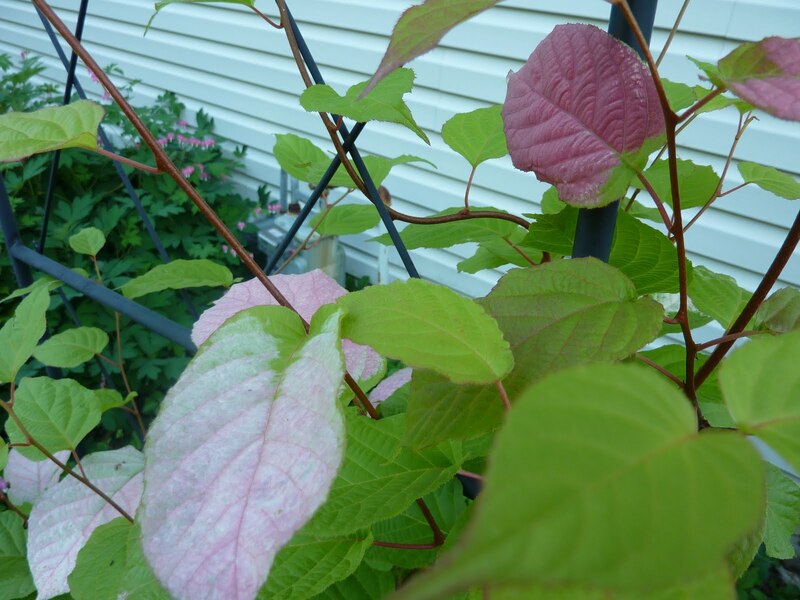 I’m going to cheat a little and include colorful foliage, since my male kolomikta kiwi is really coming into its own now. He and Mrs. Kiwi were in flower a few weeks ago, and pollination occurred, because she has teeny little fruits now, which I hope will mature, in which case I will certainly show them to you. But right now I’m enjoying those splotchy pink leaves, which coordinate perfectly with the bleeding hearts next door. Enjoy your flowers, leaves, fruits and all the other parts of your plants. How exciting that Mr. and Mrs. Kiwi are expecting fruits! The foliage is spectacular. Love the gorgeous chives. Thanks for showing how beautiful edibles are! My peas are blooming like crazy – do they count? I bought the first Maryland peas I could find at a farm stand, but mine are still in the flowering phase. Since I am forever pulling up mint, it is pea soup with fresh mint in our household! Karen, hope you'll get some peas to eat, as the weather may stay cool enough. And peas have nice flowers. Thanks, Larry and Wendy. Jennah, make sure you check out all the resources on the main Grow It Eat It page linked on the sidebar.